In 1920, Elsa Emerson is born to the owners of the Cherry County Playhouse in Door County, Wisconsin. Elsa relishes appearing onstage, where she soaks up the approval of her father and the embrace of the audience. But when tragedy strikes her family, her acting becomes more than a child’s game of pretend. While still in her teens, Elsa marries and flees to Los Angeles. There she is discovered by Hollywood mogul Irving Green, who refashions her as an exotic brunette screen siren and renames her Laura Lamont. But fame has its costs, and while Laura tries to balance career, family, and personal happiness, she realizes that Elsa Emerson might not be gone completely. 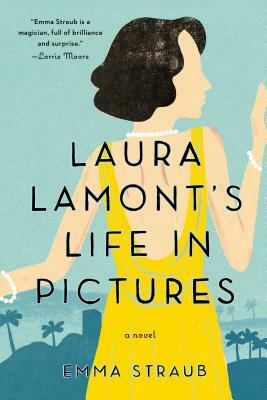 Ambitious and richly imagined, Laura Lamont’s Life in Pictures is as intimate—and as bigger-than-life—as the great films of the golden age of Hollywood. Emma Straub is from New York City. She is the author of the short story collection Other People We Married. Her fiction and non-fiction have been published in Vogue, Tin House, The New York Times, andThe Paris Review Daily, and she is a staff writer for Rookie. Straub lives with her husband in Brooklyn, where she also works as a bookseller.